Does Your Cleaning Company Provide Commercial Window Cleaning? Clean windows portray a good impression of your business and keeps up workers’ morale. What a lot of business owners don’t realize is that they do not have to hire a separate commercial window cleaning company; most commercial cleaning firms – the ones that do your daily office or retail cleaning – have the ability to clean windows up to three stories high without specialized equipment or additional insurance and certifications. However, after the third floor, scaffolding and harnesses become necessary, and this is when you would call in a specialized window cleaning company. Window cleaning may be just one of the unique services your cleaning company offers to make sure that your building is clean inside and out. When you need help with snow shoveling, parking lot clean up, pressure washing of your building, and other maintenance tasks, inquire first with the company who provides janitorial service inside the building. You might be surprised to find that they can handle your routine and periodic outdoor cleanup needs like window cleaning. Cleaning ground floor and windows up to three stories often requires the use of poles and other equipment that can be safely manipulated from the ground. Part of the job involves cleaning the window frames and sills inside and out before working on the glass. The more frequently you need your windows cleaned, the more convenient it is to contract with your regular cleaning company. Especially if you have a storefront, you know that your windows will catch dust, dirt, salt, handprints, bird droppings, food and drink spills, and water marks. Weekly scheduled services from a commercial window cleaning company will keep the windows of your restaurant, auto dealership, jewelry store, medical office, or other building sparkling and free of unsightly streaks. Whether you need an office building window cleaning in Salt Lake City or any other office cleaning services, contact Bearcom Building Services today. 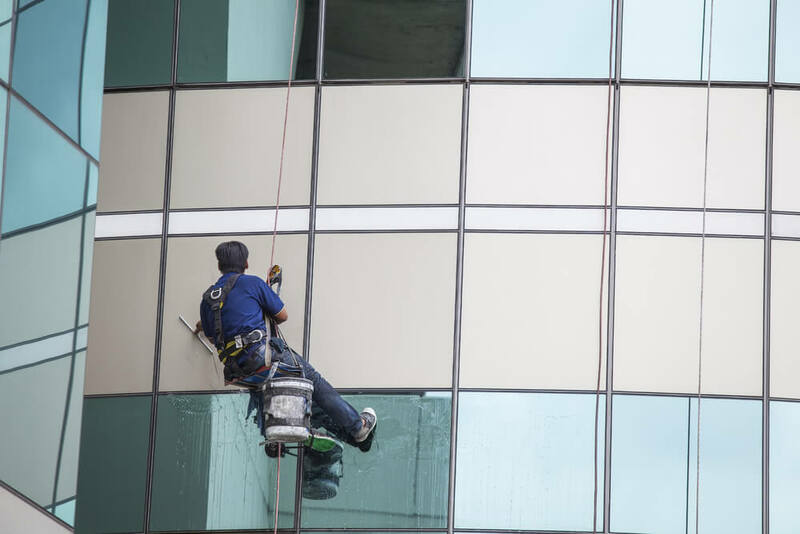 We provide office building window cleaning in Salt Lake City and surrounding areas, and offer a free consultation and estimate, as well as guaranteed results on the janitorial services we provide. School cleaning poses many challenges for administrators who are responsible for the health and safety of their students. Schools accommodate children of many ages, and may include daycare and kindergarten facilities, classrooms, computer rooms, gyms, kitchens, cafeterias, and restrooms. 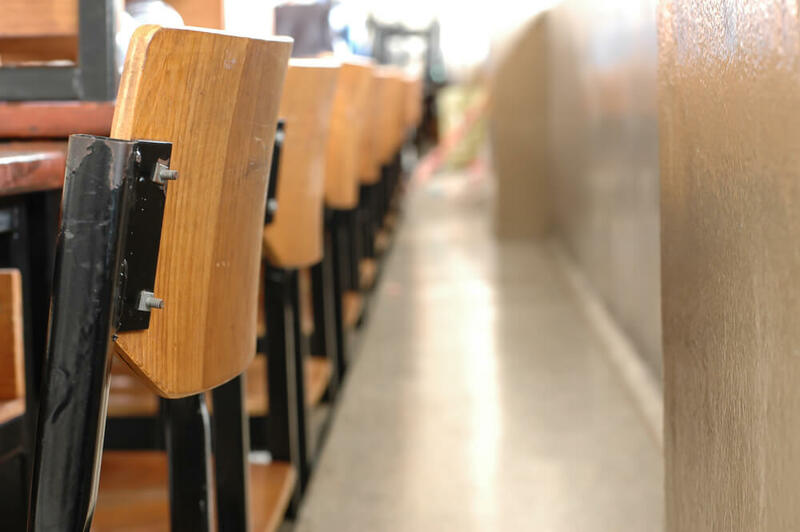 While some educational institutions handle many aspects of cleaning through their own staff, hiring a commercial cleaning company to take care of the janitorial services can provide targeted solutions to clean surfaces and kill germs, often at a lower cost. Contact with a contaminated surface is the main reason why germs spread. In schools, large groups of children touching the same doorknobs, restroom facilities, tables, chairs, computer keyboards, and toys, accounts for 80% of the spread of germs. Many viruses have a long shelf life that requires constant vigilance. Flu viruses can survive on surfaces for 72 hours, while those that lead to diarrhea exist for 2 to 4 months, and those responsible for MRSA (Methicillin-Resistant Staphylococcus aureus) infections persist for several months. Children under two put something in their mouths an astonishing 81 times an hour, while those between two and five do so 42 times per hour. While older children finally learn to put fewer things in their mouths, the average person still touches their face 18.5 times and touches 30 objects over the course of an hour. The only hope for preventing disease in daycares and schools at all levels is by properly neutralizing contamination points to prevent the spread of disease, and by teaching children to properly wash their hands. These findings make it clear that school janitorial services must be secured to prevent the spread of germs. Commercial floor cleaning techniques previously in use, which often involved hauling large string mops and pails around the facility, dusting with common cloths, or vacuuming with upright vacuums, do not do the job of removing germs, and in fact, helps spread them. 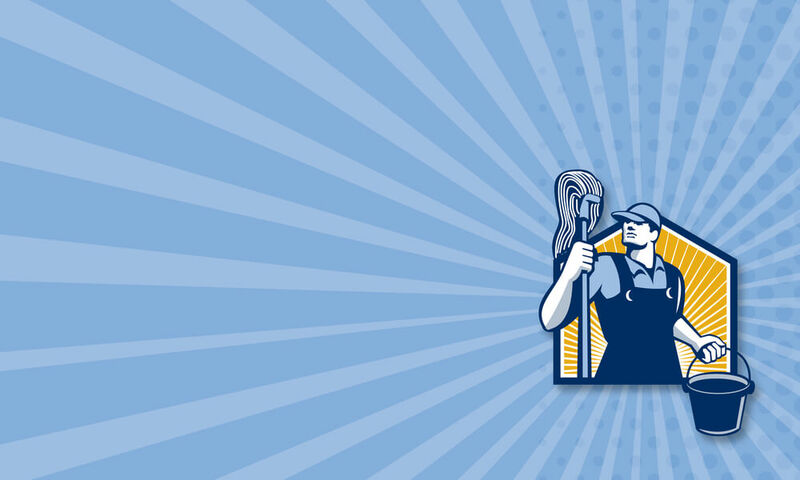 These recommendations are incorporated into the policies that Bearcom Building Services, a Utah commercial floor cleaning company, puts into practice when servicing schools. With many areas where germs can be passed from child to child, the company has a chemical management system to oversee the use of cleaning products and uses a color-coded process to keep germs separate when conducting school cleaning. If you are looking for a commercial cleaning company in Salt Lake City to service your school, contact us for a free quote today! Periodic deep cleaning, in addition to routine cleaning, is needed by your business to ensure the health and safety of your workers. If your building is subject to health inspections, you can jeopardize your business if you fail to attend to the behind-the-scenes cleaning tasks that make work areas sanitary. A failure to deep clean can be noticeable to customers. Especially if you have an establishment such as a restaurant, beauty shop, or hotel, it is crucial to not only look clean, but to be deep down clean. Whether you need deep cleaning monthly, quarterly or on some other specific schedule, utilizing professional commercial deep cleaning services guarantees the job is done right each time. How Does Commercial Deep Cleaning Differ from Routine Cleaning? The goal of routine cleaning is to remove surface dirt and grease, and sanitize areas such as kitchens and bathrooms where removing bacteria and germs is essential to prevent the spread of disease. What exactly is involved in commercial deep cleaning varies by room and by surface, but the emphasis is on cleaning beyond what is apparent. Office cleaning. While routine office cleaning includes light dusting of desks, chairs, and furniture, vacuuming and mopping, and trash removal in offices, conference rooms, reception areas, and lobbies, deep cleaning goes beyond it. It might include dusting of hard to reach areas such as vents and ceiling fixtures and more in depth attention to floors, stairs, elevators, break rooms, baseboards, and more that can collect dust and germs that provoke allergies and subtly harm the work environment. Floor maintenance. Vinyl tile floors that your cleaning professionals vacuum, mop, and buff routinely may periodically need machine scrubbing and wax stripping and re-waxing. Carpeting may need spot removal, along with hot water extraction or dry (encapsulation) cleaning to remove soil locked in carpet fibers, while tile grout requires deep cleaning to remove dirt and mildew. Bathrooms. Cleaning and sanitizing toilets, urinals, floors, sinks, faucets, and counters is part of daily cleaning. Deep cleaning involves not only remaining vigilant on those tasks, but also working on sanitizing the walls, partitions, floors, and for commercial locations that have them, baby changing stations and showers. High pressure and steam techniques ensure that no surface is left with a buildup of germs and bacteria. Kitchen. Commercial kitchens have many surfaces that are breeding grounds for germs. Cooking equipment such as stove tops, ovens, grills, and deep fat fryers are constantly exposed to fats that cling to surfaces. While routine cleaning makes surfaces ready to use, only periodic deep cleaning, often with steam, can remove what lingers in corners, on unexposed surfaces, in vents, on hoods and exhaust fans, and on floors and walls in the vicinity. Floor mats need deep cleaning and require disinfecting and sanitation. Arranging for deep cleaning throughout the year with one of the many building and cleaning service companies can make your place of business a cleaner, more sanitary place for your workers and customers. For a free estimate or to arrange commercial deep cleaning or regular cleaning services, contact Bearcom Building Services today.